My life. My love. My children. 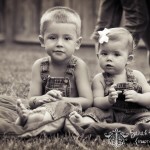 My big boy Garrett Bradyn and my baby girl Avery Laikyn. Being a momma to these precious little blessings is exactly why I believe that life is so sweet!